Scientists Find "95 Percent Proof Of The Existence Of Yeti"
Yeti, sasquatch, Todd; whatever you want to call it, it's real. At least, according to a group of scientists. The group, composed of researchers from Russia and the United States, met in Siberia recently with the express purpose of finding evidence of the elusive, shaggy beast. Fueled by the spirit of glasnost, the group set off into the wilds of the Kemerovo region, an area known for intense snowfall, foreboding trees and apparently, mythological creatures. Less than a week later, the team published findings on the 'net claiming they had found "irrefutable evidence" of the yeti's existence. These include "footprints, a probable den and various markers that Yetis mark their territory with." The hair samples are awaiting further study to determine their origin, but the scientists claim that their findings "gave them 95-percent proof of the existence of Yeti in the Kemerovo region." Not everyone is as convinced however. Loren Coleman, director of the International Cryptozoology Museum, for instance. "This does not seem to be any more than what you hear about from weekend excursions in North America that go out, discovering some hair of undetermined origin, calling it 'Bigfoot hair,' then locating some broken branches and piled trees, saying it was made by Bigfoot, and finding footprints that look like Sasquatch tracks," Coleman told the Huffington Post. "These are not 'proof' that would hold up, zoologically." If Coleman -- a man whose career literally depends on the theoretical existence of creatures like this -- is non-plussed by the team's findings, then what could possibly be the motivation for this apparently outrageous claim? If you guessed "cash money," you get a gold star. As the Huffington Post points out the Kemerovo region has very little going for it. In sum, it's a ton of inhospitable mountains with annual temperatures averaging between -5 degrees Celsius in the warmer months and a snout-freezingly cold -25 degrees Celsius in the winter. 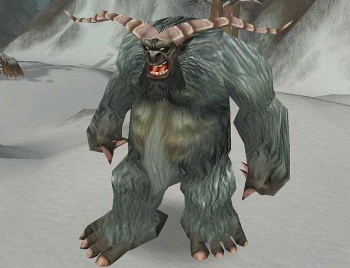 The one thing these hearty Siberians have though, is a rich tradition of yeti mythology. It's a (relatively) big tourist destination for this reason alone. In sum, this may not be the airtight evidence of wooly bipedal apes cryptozoology geeks might've been hoping for, but it should boost revenues in the Siberian hills. In related news, Vladimir Lenin's corpse is frowning.